While the world is flooded with highly extracted, red wines rich in alcohol with unclear storage potential, Alsace offers elegant, smooth Pinot Noir for every occasion. The Pinot Noir vineyard area is increasing rapidly, and the quality is elevated at all levels. 2007 Pinot Noir is very bright red. 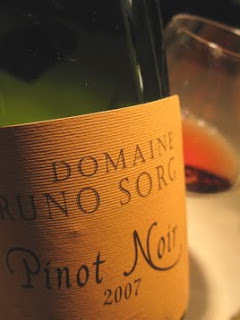 The open scent contains all the hallmarks of Pinot Noir; blueberry, strawberry, carrots in butter, bitter orange and a hint of rubber. The taste offers sweet fruit and elegant acidity, low-key but ripe tannins and sufficient tannins, in a medium-body. Aftertaste has fresh summer strawberries and excellent balance. Price: € 7. We tried Sorg's Pinot Noir Barrique 2007 at the winery about a month ago and bought a couple of bottles. After having consumed the first of them, I regret we didn't buy more. Certainly the best Alsace PN I have come across so far! While in general I remain disappointed by what Alsace producers manage to accomplish with this grape (especially in view of the revolution that has taken place on the other side of the Rhine), this is a wine I wholeheartedly like, and it's certainly worth the humble price we paid (11 €). Oops, you are right! It certainly was the non-barrique I reviewed. It certainly is a mystery that Pfalz is so extremely successful with PN while many Alsace producers struggle to get it right. But on the other hand, if you are willing to pay €33 (Albert Mann) you will get something that blows your socks of. And €30-40 is the level where the we find top-notch producers of Germany, if I understood things right. 2009 is a great year for Alsace PN. Full, supple, complex, clean. The 2008 have a but to much grip and need much more time. You're right of course that really good PN always comes at a price. But many of the introductory wines of German producers are now surprisingly enjoyable, for example those of Becker (Pfalz) and Fürst (Franken). These are wines that come at roughly the same price as Bruno's Pinot Noir Barrique, and I am glad to say that, at long last, I have found at least one Alsace producer who can give these top-notch Germans a run for their money. I'll keep Boxler in mind for our next visit, although we are of course not really going to Alsace primarily for Pinot Noir (at least not yet). It's more that it nags me, as a lover of Alsace and its wines, that, by and large, they are not really up to snuff with this grape yet (as they are with all the others), although they could and should be.